Moller International has begun producing parts for its Jetsons-like M200G Volantor, a small airborne two passenger saucer-shaped vehicle that is designed to take-off and land vertically. The M200G is the size of a small automobile and is powered by eight of the Company’s Rotapower® rotary engines. This vehicle is intended for operation continuously in “ground effect” up to approximately 10 feet altitude. You can speed over rocks, swampland, fences, or log infested waterways with ease because you’re not limited by the surface. The electronics keep the craft stabilized at no more than 10 feet altitude, which places the craft within ground effect where extra lift is obtained from operating near the ground. This lets you glide over terrain at 50 mph. Because the M200G is classified as a recreation device and not an aircraft, it is not subject to FAA regulations and anybody can operate one. Great. Just what we need is to have the same clowns that cannot drive an Escalade without shoving people off on the shoulder dropping some of their daddy's Baby Boomer inheritance on a craft that skims over damn near anything at just shy of the speed limit. It will be just a matter of time before one of those aforementioned clowns thinks they can hover into the local airport's traffic pattern right into the path of a Bonanza on short final. In my books – and it should be in the FAA's – a flying machine is a flying machine. It shouldn't make any difference if you're hovering on down the four-lane taking Johnny to soccer practice, or blasting across the flight levels in a Gulfstream V.
So if Moller can hit their price point of a projected $90,000, and if they can require some sort of license to keep these out of the hands of arrogant fools with more money then brains, this might just be a fun project to watch. If the Volentor's technology can be honed to be bulletproof and provide hours of safe, efficient hovering, I can easily see a multitude of uses for such a craft. 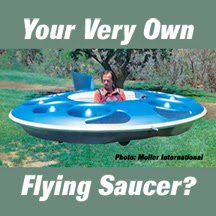 If you absolutely must have a flying saucer of your very own, contact Bruce Calkins at (530) 756-5086 ext. 33, or email him here.